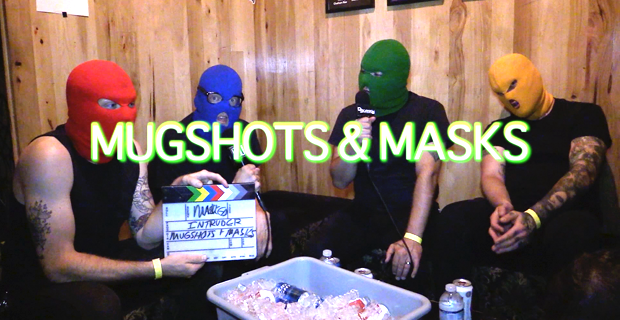 Last week, UTG TV and Masked Intruder teamed up to bring you round one of our Mugshots and Masks series. Today, we bring you round two. To be honest, I decided to approach interviewing the guys in Masked Intruder in an unorthodox fashion because it didn’t seem easy to stay on track and have a reflective conversation with a group of colored ski mask-wearing criminal hooligans. Interestingly enough, Mugshots and Masks turned into one of the best sit-downs I’ve had in a while. The creativity and brutal honesty coming out of Masked Intruder may not particularly coincide with their poppy rock riffs and melodies, but then again, no one expects a band that features a capella harmonies to sing tracks about robbing someone at knifepoint. Check out below to see the finale of our series, where the guys evaluate the masks of cultural icons ranging from Beyonce to the Hamburglar.